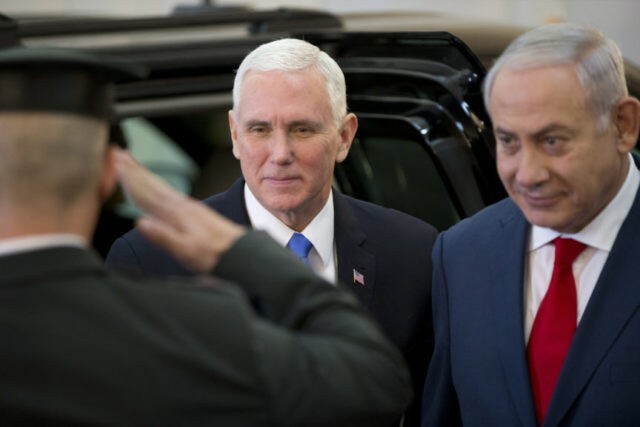 JERUSALEM (AP) — Vice President Mike Pence told Israel’s parliament on Monday that the U.S. embassy will move to Jerusalem by the end of 2019, receiving a rousing ovation as he pledged to barrel ahead with a plan that has set off weeks of unrest and thrown U.S. peace efforts into disarray. The plan to accelerate the move of the embassy, announced in the first-ever address of a sitting American vice president to the Knesset, marked the highlight of Pence’s three-day visit to Israel celebrating President Donald Trump’s decision last month to recognize Jerusalem as Israel’s capital. “The United States has chosen fact over fiction — and fact is the only true foundation for a just and lasting peace,” Pence said. Pence was preceded on the dais by Prime Minister Benjamin Netanyahu, who lavished his guest with praise and gratitude. It was all part of an exceptionally warm welcome for Pence in Israel, which has been overjoyed by Trump’s pivot on Jerusalem. But the move has infuriated the Palestinians, with whom Pence is not meeting, and upset America’s Arab allies as well. A group of Arab lawmakers voiced their displeasure at the administration’s perceived pro-Israel bias by raising banners reading “Jerusalem is the capital of Palestine” and heckling Pence at the beginning of his address. They were then forcibly removed from the plenum. Pence responded to the ruckus by saying he was humbled to speak before such a “vibrant democracy,” before delving into his prepared remarks about the two countries’ unbreakable bond. Pence said the American administration urged the Palestinians to return to negotiations. “Peace can only come through dialogue,” he said. Pence said the U.S. would support a two-state solution but only if both sides support it. Netanyahu’s hard-line government is dominated by opponents to Palestinian statehood, making such a scenario unlikely. The Palestinians say the U.S. is no longer an acceptable mediator, and they have pre-emptively rejected any peace proposal floated by the Trump administration, fearing it will fall far short of their hopes for an independent state in the West Bank, east Jerusalem and Gaza, lands captured by Israel in the 1967 war. The Palestinians have refused to meet with Pence. In an expression of that snub, Abbas overlapped with Pence in Jordan from Saturday evening to midday Sunday, when the Palestinian leader flew to Brussels for a meeting with European Union foreign ministers. There, Abbas is expected to urge EU member states to recognize a state of Palestine in the pre-1967 war lines and to step up involvement in mediation. In Brussels, the EU’s top diplomat Federica Mogherini said the aim was “to support an international framework to accompany direct negotiations,” despite the U.S. decision to recognize Jerusalem as the capital of Israel. A small group of Palestinians in the West Bank town of Bethlehem protested Pence’s arrival by burning posters with his image. In the West Bank city of Nablus, dozens of Palestinians chanted against Trump and stepped on pictures of Pence in a sign of anger. Netanyahu called Pence “a great friend of Israel” and said there was “no alternative for American leadership” in the peace process. Earlier Monday, Pence placed his right hand over his heart as an honor guard greeted him with the American national anthem. White House Mideast envoy Jason Greenblatt, U.S. Ambassador David Friedman and the Israeli ambassador to Washington, Ron Dermer, joined the ceremony, and Pence chatted briefly with Israeli soldiers before beginning his meeting with Netanyahu.